Pass thehttp://4.bp.blogspot.com/-BQkG2GG8xyo/UBSxrx_OVzI/AAAAAAAACfU/oTJ-PC_BZ Slipped Stitch Over: frack free. Just a quick post this morning to support what has been called the biggest demonstration in the world. Perhaps not in numbers but in space. 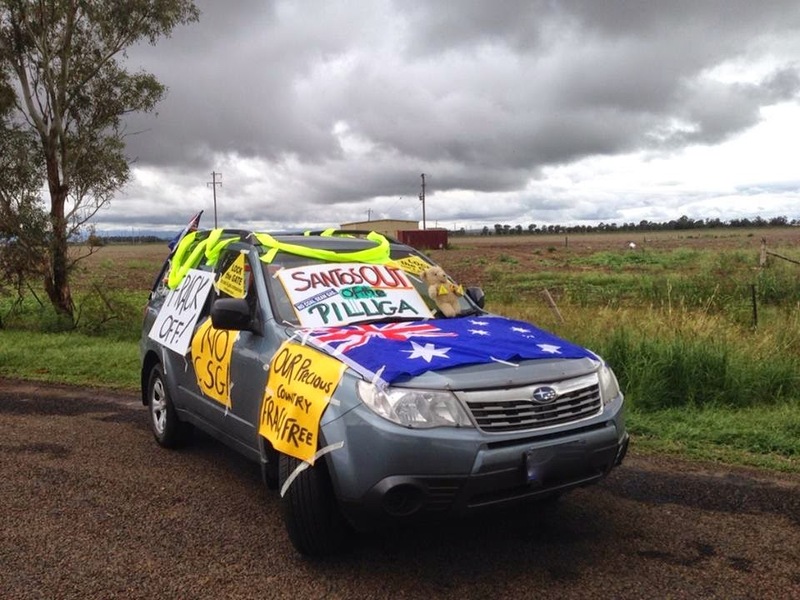 There is a car decked out like this every five kilometres from Dubbo, I think to Narrabri. The demo has also taken off on other highways in NSW. My sister and her husband were rangers at Mt Kaputar out of Narrabri before their daughter was born so she has taken up a position in the area. It took her most of yesterday to get there from her place and she is staying on a cotton farm of one of the organisers. It will take most of tomorrow for her to return to her home on Mid North Coast. On passenger side of the windscreen you can see Freedom, the bear I gave her after her first cancer operation in 1997. He is much travelled, all over Australia in car and van and has now become politically active. Click to see more clearly.